The Bizone issued the set of stamps shown above (Mi. #103-05 (Block), Sc. #662-664, #664a) on April 22, 1949, to publicize the Hannover Export Fair. These stamps were watermarked crosses and circles, as were the rest of the commemorative postage stamp issues of 1949. 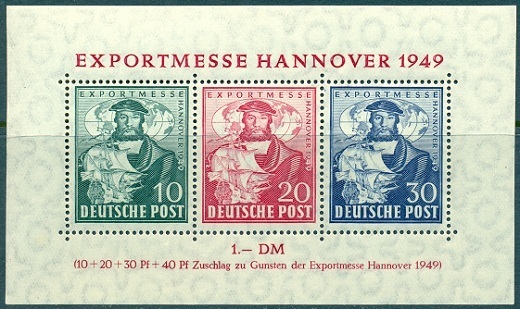 The three stamps depict Hermann Hildebrandt Wedigh (d. 1560). The stamp designs feature a portrait from a 1533 painting by Hans Holbein the Younger (1497-1543). Behind the portrait is a map of the world. At the lower left side of the portrait is a depiction of a Hanseatic trading ship. Hermann Wedigh was a member of the Wedigh family of Cologne, who were merchants and members of the Hanseatic trading company in London. Unfortunately, little historical information about Wedigh is available today, other than his being the subject of some of Hans Holbein the Younger's paintings. The souvenir sheet above sold for 1 DM, with the surtax contributing to the fair. The two stamps shown above (Mi. #106-07, Sc. #B304-05) were issued May 15, 1949 to publicize the Bicycle Tour of Germany. The Deutschlandtour, as it was called, a 1,500 Km. race, was first held, as a national event, in 1931. The race was discontinued after 2008, due to allegations of doping problems. These three stamps shown above (Mi. #108-10, Sc. #B306-08) were issued on August 15, 1949 to commemorate the 200th Birthday of the famous German writer Johann Wolfgang von Goethe (1749-1832). His body of work includes epic and lyric poetry, prose and verse dramas, memoirs, an autobiography, literary and aesthetic criticism, treatises on botany and anatomy, and four novels. In addition, numerous literary and scientific fragments, more than 10,000 letters, and nearly 3,000 drawings by him are extant. The 10 Pf. depicts a portrait of "Goethe in Rome" and the other two denominations depict portrait paintings by other 18th Century artists. The surtax amount provided aid for the Reconstruction of the Goethe House in Frankfurt am Main. In August 1949, the Western Allied occupation zones were combined to form the sovereign nation of the Federal Republic of Germany. The British, American, and French zone stamps were replaced by those of West Germany, though many of the Allied occupation issues remained valid for postal use as late as 1951.